With its large cooking surface and sleek chic style, the De’Longhi Contact Grill CGH902 is ideal for families. 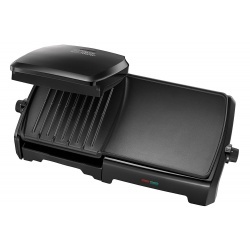 Featuring 2 sets of removable die-cast plates, 1 set of grill plates and 1 set of griddle plates, the De’Longhi Contact Grill has 2 different functions/cooking positions. In 'contact' mode, you can quickly grill hamburgers, sandwiches, vegetables and chicken. Alternatively, you can open up the grill, doubling the grilling surface, to cook meat and fish. To help make your cooking healthier, the De’Longhi Contact Grill CGH902 has a 'Perfect Oil Drain System' to drain away grease and fat, allowing grilling to happen without the need for additional oil or butter. 2 practical grease containers collect the drained fat from both plates and can be easily cleaned. The Contact Grill has a practical cool-touch rubberised handle that protects your hands and complements its sleek silver appearance. 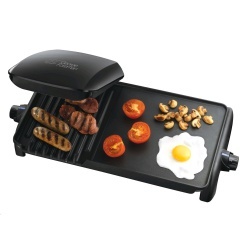 The grill also comes with a spatula to help remove food and help with draining fat. For added convenience, the removable grill plates are dishwasher safe.